On April 8, legendary video game retailer Games Maya closed, bringing to a close a 35-year history. Some of the biggest names in Japanese gaming paid their respects. Games Maya wasn’t a mega-corporate chain retailer, but a mom and pop operation. Frequented by game industry types, the shop was known for its impressive stock, fair prices, and its ability to nab famous devs for in-store appearances. Games Maya was immortalized in Level-5's PSP game Little Battlers Experience, and shop manager Hisako Akitani was often interviewed in the game press. Akitani decided to shutter the family-owned shop due to health reasons after her doctor said she needed to slow down and rest. She thanked everyone for their patronage, and Japan’s gaming’s biggest names came out to thank Games Maya. 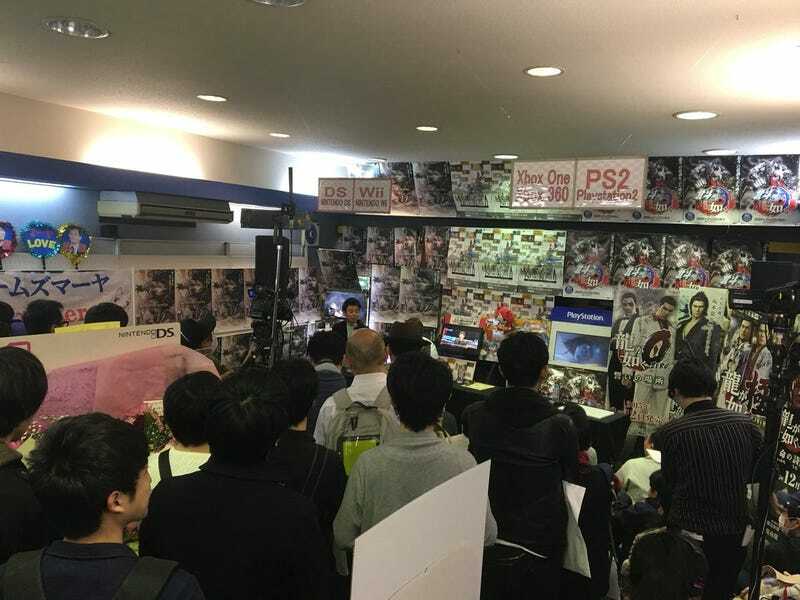 Game Center CX’s Shinya Arino live-streamed an event during the shop’s last day. As Famitsu reported, Akitani was in good spirits. She not only worked the register, but gave a talk, signed autographs and posed for photos. Via Denfami Nico Gamer, just look at who came to Games Maya’s last day. Atsushi Morita, president of Sony Computer Entertainment Japan Asia. Square Enix producer Shinji Hashimoto. Monster Hunter producer Ryozo Tsujimoto, Yakuza producer Toshihiro Nagoshi and Level-5 honcho Akihiro Hino. Those who couldn’t make the final day sent video messages. Such as Arc System Works’ Toshimichi Mori and Daisuke Ishiwatari. Yusuke Hashimoto and Hideki Kamiya from PlatinumGames. Cake and flowers were also sent to say thanks. Written well wishes also came from numerous famed game developers, including Hajime Tabata and Hideo Kojima. The banner reads, “Games Maya Forever.” It’s quite moving to see a game shop and its manager held in such a heroic light.